My recent trip to Romania was such an inspiration. I met with fellow bloggers at a local Food Bloggers Conference, I visited a couple of restaurants and talked to some very talented Romanian chefs. But maybe the most inspiring moment, was a private market tour organised by my best foodie friend Monica at the biggest farmer’s market in Bucharest: Piata Obor. As I grew up in a rather big Romanian town, going to the local farmer’s market was a weekly habit. Back in the times, the farmer’s market was the only place where we could buy our food. But as the big supermarkets started to open shops in town, farmers markets began to lose momentum. Soon, going to the farmers market began to feel like a chore. It wasn’t ‘cool’ anymore. Then I moved to London, and the only thing close to what I knew as ‘farmer’s market’ was Borough Market. I was fascinated by all the beautiful fruits and vegetables on offer. And I still am. Only that Borough Market is a completely different experience. And well… I can’t exactly go there for my weekly shopping. So back to Piata Obor in Bucharest, I was struck: mountains of fresh cherries, strawberries, tomatoes, green beans, yellow beans, peas in their pods, little gerkins, all the herbs and seasonal vegetables you can think of. All fresh from people’s gardens or small farms. And for a fraction of the price I’d pay anywhere in London. I wanted to get a bit of everything. I wanted to go home, with bags full of fruits and veg, and throw up a party. I wanted to spend a day or two at that market, talk to the farmers, talk to the customers and tell them how lucky they are. I felt like crying. Where did we – the western consumers – lost all of that? And most important: will we ever going to get it bak? I left Piata Obor with a big bunch of lovage. I took it to London. And for almost a week now, I’ve been using it in everything I cooked: stews, broths, salads, pasta. Everything. To remind me of home. To remind me of our amazing farmers. Our humble markets. And of the simple joys of life. 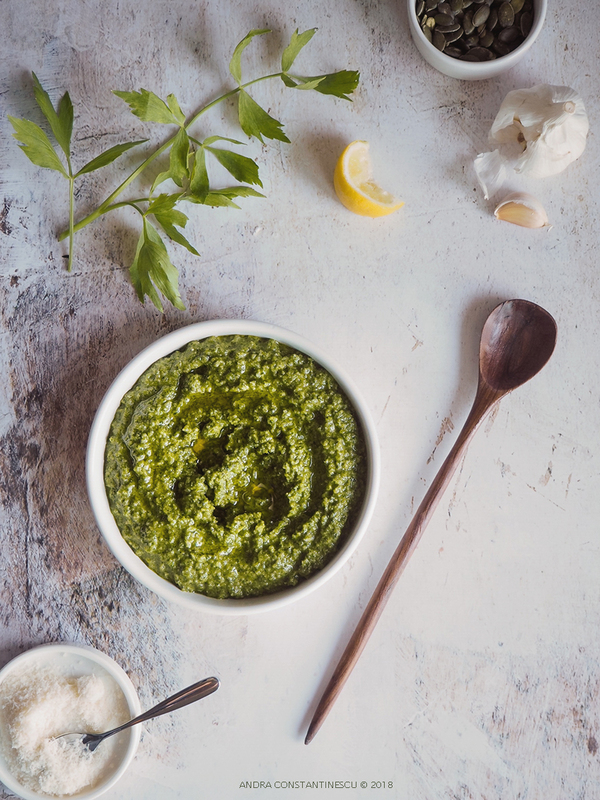 Lovage pesto with lemon and pumpkin seeds is a play on the traditional basil pesto recipe. Lovage pesto can be used as a condiment for pasta, or as a dressing for summer salads. A light, warm salad of french beans, lovage pesto and mozzarella. Ideal for a quick, healthy lunch or dinner. To make the pesto, put lovage leaves, garlic, parmesan and pumpkin seeds in a food processor and pulse several times until a coarse paste is formed. Add lemon zest and juice as well as the oil and continue processing. Season with salt. The recipe will only asks for a teaspoon of pesto, so you can put the remaining lovage pesto in a jar and store in the fridge for 3-4 days. Blanch the french beans in salted boiling water for 2-3 minutes, then remove into a bowl of ice to preserve the vibrant green colour. To make the salad, gently fry the sliced garlic in a non stick pan drizzled with rapeseed oil. Add the french beans and a teaspoon of pesto and stir until just warm. Transfer the salad to a plate, add the baby mozzarella balls on top and serve immediately. Serve with a wedge of lemon on the side. If you can't find fresh lovage, you can replace it with basil, to make a variation of the classic basil pesto. The salad can be made in advance for your lunch box, as it stores well in the fridge.